Addiewell opened in 2008. It houses all offender types with the exception of females and convicted young offenders. The prison is situated in the village of Addiewell, which is in the central belt of Scotland, between the two largest cities, Glasgow and Edinburgh. The prison was built on a site formerly known as Addiewell chemical works which produced paraffin oil. It was an active site for nearly 100 years, opening in 1860s and finally closing in 1956. 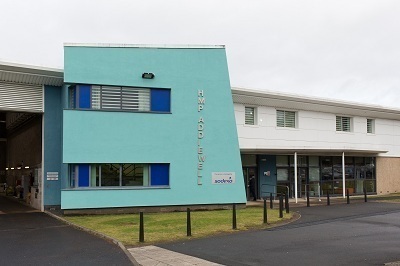 Addiewell is designed as a “learning” prison, where offenders can address their offending behaviour and the circumstances which led to their imprisonment. The learning aspect aims to improve their employability prospects, their wellbeing and community support networks, leading to a reduction in reoffending. Addiewell provides 40 hours of purposeful activity, per offender, per week. Purposeful Activity is divided into three main areas: Learning and Skills, Jobs and Programmed Interventions. We also adopt an effective Peer Support Model, where offenders are identified for support roles throughout the prison. They act as positive role models for fellow offenders and assist staff in the delivery of classes, programmes, sports activities, induction and offender support services. From M8: Leave the motorway at Junction 4 (signposted Bathgate/Falkirk/Whitburn). At the roundabout below take the exit for the road heading to Blackburn/Whitburn. Turn left at the traffic lights and head towards Blackburn. About a half a mile later and at the next set of traffic lights, turn right onto the B792. The turn off for Addiewell is two miles up that road. Turn right onto Livingstone Street, then left into Station Road. The prison entrance is about 200 yards along that road. From A71: In West Calder Main Street, turn left (right when travelling from Edinburgh direction) down Cleuch Brae into the B792 road for Blackburn. The Livingstone Street turn off for Addiewell village (as above) is two miles along that road. There is full parking facilities with disabled bays. The village is served by a number of bus routes and there is a bus stop within walking distance of the prison. Bus timetables are available at the visits waiting area. Addiewell railway station is a very short walk from the prison, on the same line as Shotts, serviced by the Glasgow Central to Edinburgh train. The train runs through Cambuslang, Uddingston, Bellshill (connections to Motherwell and Lanark), Carfin, Cleland, Hartwood and Shotts in Lanarkshire, before going through the West Lothian towns of West Calder and Livingston then onto the capital. Addiewell has a bright and comfortable visits hall, which holds up to 50 visits at any one time. The visitors’ centre is run in partnership with Cyrenians offering support for those are visiting the prison. We aim to make the visit experience as enjoyable as we can, but at the same time ensuring that safety and security procedures are adhered to by all visiting Addiewell. There is full wheelchair access to the visits hall and disabled toilet facilities. Please ask staff questions if you have any concerns with regards to your visit. On a first visit, visitors must bring approved identification (listed below) to register on the electronic system which records their photo and finger scan image. First time visitors should arrive at least 20 minutes prior to the first visit, to allow time to register. Once visitors are on the system, the process will be quicker. Children will not register on this system; however names and D.O.B. of all children must be recorded on the booking. All visitors can expect to be searched when entering the prison. There are signs explaining search procedures and these will include rub-down searching, metal detection portals, electronic scanners, drug detection dog searching and Ion scanning. Staff can answer any questions you may have regarding searching. If photographic identification is not provided, the Operations SPCO/Manager will be contacted for advice. The visitors’ centre provide meaningful support and information for families and friends affected by imprisonment. If you have not visited a prison previously are advised to speak to staff, particularly if you are unsure of prison procedures. The visitors’ centre has information notice, toilet facilities and lockers for any belongings which are not permitted in the visits hall. Staff will advise on this. £1 coin is required to use the locker. On entering Addiewell you turn right into the visitors’ centre where you should deposit any property for the offender prior to the visits. You will be searched by trained staff, processed through the biometric- finger scan and then taken to the visits hall by staff. Visitors will be directed to their allocated seat and will be met by offenders, who must remain seated in their allocated seat, at all times. The visits hall has a cafe with hot/cold refreshments and a children’s play area (parents are responsible for supervision). Staff will inform offenders and visitors when the visits are finished and will accompany visitors back to the visitors centre. Visitors cannot simply choose to bring in property for someone in custody. Offenders must first complete a property form if they would like a family member/friend to hand in property, which will be approved by reception.Once property is handed in it will be processed as soon as possible and will be in the possession of the offender within 5 days. Please note that property can only be handed in during visiting times. You can post in property for offenders, but again the prisoner must have completed the form prior to the items arriving. Mark the parcel for the individual’s attention. To ensure the parcel arrives safely, you can send it recorded delivery (cost incurred at the post office). Cash handed in at the property desk, can only be done during visiting times. A maximum of £50 can be handed in. Offenders can be sent money (advise recorded delivery) postal orders or cheques in the post. Cheques will be banked by finance dept and can take up to 10 working days to clear. Convicted offenders are responsible for booking visits and will receive guidance on the process from wing staff. For those in remand they can also book their visits but have to give 24 hours notice. Alternatively, visitors can book remand visits using the dedicated phone line: 01506 874 500 select option 2, again allowing 24 hours notice. When phoning the visits booking number visitors should know the individual's name, number, date of birth, the date & time of the required visit and details of who is visiting. You will need to provide names, date of births and addresses. The visit booking line is open Monday to Friday 9am to 12pm and 1pm to 4pm. Legal visits are booked by telephone 01506 874 500 select option 2, again giving 24 hours notice. The visit booking line is open Monday to Friday 9am to 12pm and 1pm to 4pm. Specific visits complaints forms are available in the visits waiting area. All other complaints/comments should be made in writing to the prison.